Thoughts of THAT Mom Thoughts of THAT Mom: Review Day: "Where Am I Wearing?" Review Day: "Where Am I Wearing?" I have just finished reading one of the most provocative books I have ever come across. This book left me intrigued and fascinated with where my clothes are made. Not only that, but it left me wanting to know the origin of everything I use on a daily basis. I doubt anyone could leave this book without feeling the need to do something. 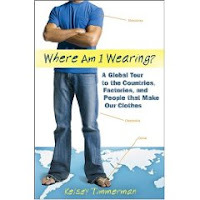 "Where Am I Wearing" chronicles author Kelsey Timmerman's journey through the companies, factories, and people who make his clothes. His journey takes him from Honduras to Bangladesh, from Cambodia to China, and back home again to a company and factory in the United States. "Sweatshop" is not an unfamiliar word to anyone in America. Yet Mr. Timmerman leaves his tour with a much different view of the word and the garment industry than the reader expects. Through his journey, Mr. Timmerman poses questions and proposes solutions that aren't typical of the garment-industry protester. In fact, he sets himself apart from these protesters by having actually visited the factories and met the people who make his clothes. As a homeschooling mom, Mr. Timmerman leaves me desiring to take a similar journey with my children. It's an experience every American could use in their lifetime. The reader should be aware that reading "Where Am I Wearing" might be uncomfortable. It might force you to look at your own life differently, and it will likely move you to action of some sort (even if just to look at your own tags before you get dressed in the morning). Mr. Timmerman took a chance when he jumped on a plane to Honduras. It was a chance worth taking as he has produced a well-written, thoughtful book that is WELL worth the read. This is Kelsey. Thanks for the thoughtful review. Annie and I are expecting our first child and like you, I hope I can introduce my kids to other peoples and places to enhance their global perspective. I have this dream about my family visiting a remote village and my kids spending all day playing with the local children. Until after college, I primarily saw the world through books and pictures, but to go out and see it at a young age would be a great education. Glad you liked the book. Thanks for your kind words. I always honestly review books listing the good, the bad, and the ugly.